Grinding a garage floor versus acid etching is a topic of much discussion when it comes to preparing concrete for epoxy or other garage floor coatings. Also known as profiling, it sometimes comes as a surprise to people when they find out that you just can’t paint or coat over the concrete and expect it to adhere properly. Typical questions asked are “Why do I need to grind or etch my concrete?”, “Which method is better?” or “Why do I have to etch new concrete?” With these questions in mind, let’s look at why concrete has to be prepared properly for a coating and which method may be best for you to achieve the results that you need. Do I Need to Etch or Grind my Concrete? Unlike applying paint, garage floor coatings need to penetrate and bond mechanically to concrete in order for them to adhere properly. The problem, however, is that concrete for a garage is always finished to provide a smooth and even surface. This finishing process reduces the porosity of the concrete. As a result, the thick and viscous nature of coatings cannot penetrate and soak into the surface very well. Profiling exposes the pores in concrete so that the epoxy coating can penetrate the surface better in order to get the best bond. It also creates a rougher surface for the coating to adhere to. This is typically done by either grinding the surface or by acid etching in order to expose these pores. Poor profiling, or lack thereof, is the number one reason why floor coatings fail and peel up. Most garage floor epoxy coatings require a minimum CSP-1 profile to adhere properly. Contrary to what some DIY installers assume, newly poured concrete or concrete from a new home still needs to be profiled (etched or grinded). Though it is fresh and clean without any stains, it needs the pores of the finished concrete to be opened up in order for the epoxy to penetrate and bond to it. Which is best, grinding or acid etching? When it comes to preparing concrete for a garage floor coating, the best method is to grind the garage floor. One of the reasons for this is that the profile of the surface can be controlled to provide the desired outcome. It provides a rougher and more porous surface that is considered ideal. It will also remove excess laitance that acid etching doesn’t always remove. Concrete laitance is a very thin and weak layer of concrete at the surface which can be created from the finishing process. 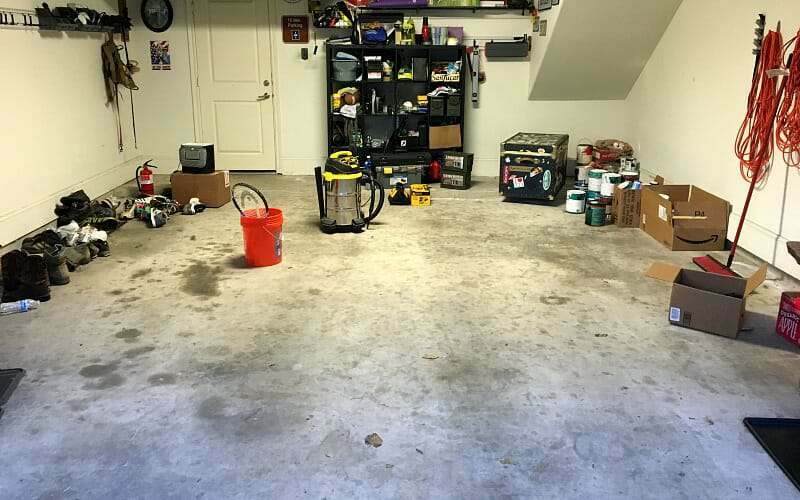 If a garage floor coating attaches to this weak layer, it can easily chip from impacts or eventually peel up, exposing a fine layer of concrete on the underside of the coating. 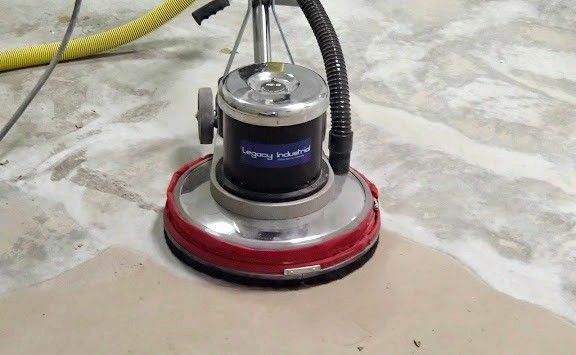 In addition, if you have any garage floor repairs that need to be made first, grinding will smooth out those repairs so that they don’t telegraph through the coating. Professional garage floor coating contractors who warranty their work will always grind the concrete knowing that their floors will not fail due to insufficient profiling. 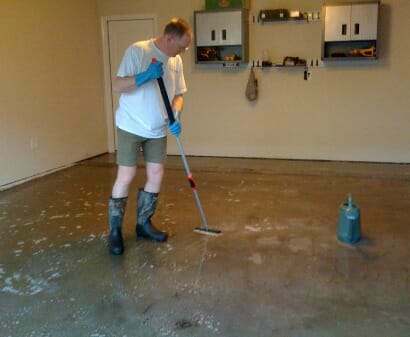 The problem with grinding your garage floor, however, is that it’s not always feasible for the average person to do so. There is the question of where to rent the equipment, how to control the dust, gouging of the surface due to inexperience, and finally cost. Sometimes it’s just not in the budget. This is why acid etching is still a popular practice. If done properly, acid etching can provide a satisfactory surface for an epoxy coating to adhere to. It is fairly easy to do as long as you are safe. It provides a better alternative to grinding for many and can be downright cheap in terms of cost. The problem is that the uniformity of acid etching cannot be controlled like it can with grinding. Because the density and finishing process of a concrete surface can vary, so can the effectiveness of the etching. This is why it is important to test multiple areas of the surface for porosity and texture once you have etched. The easiest method is the water drop test. If the concrete immediately turns dark and begins to absorb water, then that area is good. If it doesn’t, then you will need to etch those areas again. If you don’t test the concrete after etching, you run the risk of having areas of your coating that can fail. Note: If you have a sealer or coating on the concrete, acid etching will not work. You will have to grind the floor to remove it. If you are going to hire a contractor to install an epoxy coating in your garage, make sure that they grind the concrete. Any contractor that wants to acid etch is just cutting corners to reduce costs and should be suspect of providing a good quality floor. If this is a DIY installation and you are fairly confident with your abilities, you can rent or purchase the proper grinding equipment necessary for the job. In most cases you should be able to grind a two or three car garage in less than a day. There is also the option of hiring someone to do it for you. If grinding is not in the budget or you are not comfortable with doing it, then acid etching is your answer. If you are uncomfortable with using muriatic acid, there are a few commercially available products other than muriatic acid that can etch your floor safely as well. Remember, acid etching will not remove dirt and oil from your concrete floor. It still needs to be cleaned first. Etching works by reacting with the free lime in concrete. If the concrete is coated in oil or grime, the acid will not be very effective. Whether grinding or acid etching, if not done properly, your coating is destined for failure. It is the most important part of applying a garage floor coating and crucial that you do it correctly. There is nothing worse than spending the time to apply a beautiful epoxy floor coating only to have it fail due to the improper profiling of your concrete. If you take the time to do it correctly, you will be rewarded with a coating that will adhere like it should. 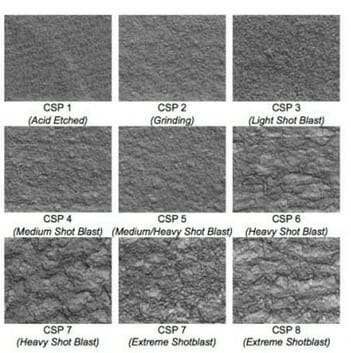 Note: Shot blasting is another form of mechanically profiling your concrete that is widely acceptable to grinding and is used by some professional installers. Due to the cost of renting these machines and the experience required to shot blast effectively, we did not discuss this option here. Hi Shea. Thank you for this blog- very informative! I have a two car garage that was epoxy coated about 14 yrs ago. The epoxy is in good shape with only a few hair-line cracks that are thinner than…a human hair. I have one front corner that does not slope properly where the water puddles significantly every rain storm (roof has no overhang). I would like to leave the existing epoxy floor alone, degrease it with simple green or purple power, sand it well with 80-100 grit sandpaper, then build-up and re slope the corner area- 1/4″ at the side wall to feather edge at 2′ out (total area 2′ x 7′) with an epoxy/clean sand mix. Then, recoat the whole floor so the color will be uniform and new looking again, with two coats over the built-up area. I would like to use Windex or denatured alcohol on my trowel to smooth the built-up area as much as possible, but am concerned that it might affect the adhesion of the following coats.? Could you please tell me if I seem okay with this proposal? Am I over looking something? If you have any suggestions/thoughts, I would be most appreciative! Thank you. It’s a good plan Glen. We recommend grinding the area you build up using a turbo cup concrete wheel on an angle grinder. It will smooth out that area and provide a nice transition to the rest of the floor. The grinding preps the patch as well so that the new coating will adhere to it without issue. 1) I used dyma-dots for medium hard concrete as I didn’t know the actual hardness. Given the glazing outcome was it likely soft or hard concrete? 2) what would be the best way now to achieve CSP2 or even 3 for higher build applications? Hello Philip. From your description, glazing generally occurs due to using a hard diamond bond segment on hard concrete. You will need to use a Dyma Dot for hard concrete which should be a soft bond diamond segment or dot. I believe they are the red ones if I remember correctly. Go over those sections again and it should break the glazing and achieve CSP2 profile. I have a 15 month old garage floor that has never been sealed but must have been power trowled since it is smooth as glass. Water doesn’t bead up but it will sit on the surface for a long time before it will absorb in. I am planning on installing a waterbased dye with a couple coats of 1 part polyurea over top of it. I am struggling to figure out if I really need to rent a buffer and use either sanding screens or the ones with diamond flaps to mechanically grind it or if acid etching is really all that I need for this. Any help would be appreciated. Hi Pete. Unless the surface is extremely hard and dense, acid etching will usually get the job done for what your project entails. Since muriatic acid is cheap, we recommend that you do a test in a small inconspicuous area. Etch the surface at a ratio of 3:1 water to acid. Make sure to follow all the steps, including neutralizing and rinsing. Once it has dried, do a water drop test. If the concrete turns dark and absorbs the water quickly, then you will be good to go. If it doesn’t absorb very quickly or takes a while before the concrete darkens, then you will want to grind the surface. A sanding screen will not get the job done. Hello. Thank you for some good answers. I have a garage floor that has never been painted, but is about 40 years old. It has many “spalling” patches where it looks “crumbly” It seems solid, but you could vacuum up these little areas of exposed aggregate forever and always pull up some dust and a little stone now and then. Will a good prep and clean followed by a quality self leveling compound provide what I need for a long term epoxy floor substrate? Yes it will, Mark. Just make sure any loose (crumbly) material is removed first. My Garage floor is sealed with few big oil spots and few cracks going from one end of garage to other. From your article, it is clear that I will have to use grinder, but I also have to fix the cracks. Now the Rustoleum steps are to remove grease, do the concrete patch, do etching and then apply paint. Now if I use grinder, will it take care of grease spots? And do I do concrete patch first and then next day do grind? Also, in your another article about grinder, you mentioned concrete prep tool & removal tool. To remove sealer, shall I use prep tool or removal tool? Hi Saum. Do any necessary repairs first, then grind. The concrete prep tool is fine if you have a sealer. If there was paint or a coating on the surface then you would want to use the removal tool. Grinding will help with the grease spots. What it may require is grinding first, then attacking the spot with a good degreaser since the grinding will open the pores of the concrete. It really depends on how deep the oil penetrated. If the area readily absorbs water after grinding then you are good to go. If it beads at all or sits there, then you have more cleaning and grinding to do. I was wondering. I have a shop floor apx. 1000 sq.ft. that I have used expoy paint on. Perhaps in the past I have not prepare the floor properly and as a result it later peeled. Three years ago, I scraped all the loose epoxy paint off that I could, removing apx. 50% of it. I then rented a grinder that you installed stones on the disc and spent say 8 hours grinding, sanding as much of the remaining epoxy paint off that I could. I found it took some off, dulled some of it but did not remove it all. I then applyed an epoxy paint which is now peeling a fair amont again. Any advice before I try this again ? Thanks. Hello Alec. It sounds like you may have not used an aggressive enough diamond disc to grind with. What brand and type of epoxy did you use? I want to apply an epoxy covering to my garage floor. It looks like the floor has been sealed. When water is poured on the floor it beads up. There is also some vinyl adhesive on part of it. From what I have been reading I cannot use muriatic acid because it is sealed. What are your recommendations? Also I am planning on using a rustoleum epoxy floor kit. Would you recommend the garage or professional version? The garage is used as a woodworking shop. We do not park cars in the garage. Hello Susan. You will need to grind the concrete in order to remove the sealer and glue residue. We have an article about grinding here. The Professional Rustoleum is a much better product for the money. I live on Molokai and don’t have access to a concrete grinder to rent. I’m planning on applying Rustoleum epoxy to the concrete slab in our shop area, about 400 sq ft. I’ve been trying to powerwash the paint off the slab for the last 3 days and I’m only about 30% done. If I got, lets say, 90% of the paint off and the remaining paint was little dime size areas sporadically spread out over the slab, would the epoxy still fail? Any suggestions? Hello Michael. If you don’t have access to any type of grinding equipment then you should try a paint stripper. Once you get the paint up you can then etch the concrete. You can’t etch paint. If you apply the epoxy to the paint, it will just begin to peel after a while. Epoxy will only adhere to a properly profiled surface. Can you not just clean, then apply a primer, then the epoxy? I am seeing some places selling the epoxy kits with the primer, wouldn’t it defeat the purpose for profiling? No, an epoxy primer is not used to avoid proper concrete preparation. You can read when and why you should use an epoxy primer here. If a manufacturer states that the substrate needs to prepped via grinding or etching, then that is what needs to be done regardless. There are no short cuts if a manufacturer requires it. Prepping the surface properly ensures that the coating penetrates into the pores to achieve the mechanical bond that it requires. That said, if you are trying to avoid concrete preparation, there are a couple of coatings that can be applied without etching or grinding if the concrete passes a prescribed water absorption test. DuraGrade Concrete by Rust Bullet is one. All Weather Floors epoxy is another. We suggest you read about those to see if one may suit your needs. I want to put down a new covering on an old floor. I had garage paint for nearly 20 years that held up daily well, but needed to be taken off. I did grind the floor as recommended, but there are still some areas along walls that grinder did not reach. I was planning to acid wash the entire floor prior to new coating. Will that suffice? Hi Wally. If you removed the old paint via grinding, then an acid etch is not necessary. You should have freshly ground concrete exposed for the new coating. You can do one of two things for the edges that still have paint. The first is if the paint is adhered well, you can sand the paint with 80 grit sandpaper in order to provide a good mechanical bite for the new coating. If these areas will not see traffic or equipment sitting on them, then you will be OK. The other thing you can do is purchase a 4.5″ angle grinder from Harbor Freight for $15 and concrete turbo cup wheel from Amazon for around $12 and then grind those edges right down to the bare concrete. I’m planing to coat my basement floor with epoxy and due to some limitations (some heavy items that I cannot get out of my basement), i have to work on parts of the basement at a time. So I plan to move all the items to one side, prep the other side and then move the items to that side and prep the rest. Unfortunately I will have to take similar approach when I’m applying the epoxy and I’m wondering whether I can let part of the prepped floor remain uncoated for a week (may be two) with all the heavy furniture etc on it while the epoxy on the other side sets/dries to allow me to move the items to the epoxy side and coat the remaining? In short, can I let a prepped floor sit for week or two before applying the epoxy and if yes, what do I need to do before I start coating a week old prepped floor? Hello Aseem. I have a couple of questions for you first. Did you do a moisture test first before deciding on epoxy? In other words, are the any moisture issues in the basement? Also, do you have any contraction joints that run down the middle of the basement floor or is the floor seamless? I have not done it yet. I plan on doing it in the next day or two. I don’t think it will be a problem though. And the basement floor does not have contraction joints. It has held up quite well though for over 50 years, with only a couple barely noticeable cracks. OK. The reason I ask about a moisture test is that unlike paint, epoxy is a non-breathable coating. If actual moisture or moisture vapor builds up under the coating it will cause it to delaminate. That is why you have to be sure about applying a coating in a basement. You can apply epoxy to one half of the floor and then do the other half. However, since your surface is seamless and without contraction joints, you don’t have anything to act as a natural divider. Coatings do not blend together well like paint on a wall. What will happen is that you will have a very obvious demarcation where the second half overlaps the first half. That is why a joint works so well. Your best bet is to tape off a border for the second half so that you have a clean line where the overlap occurs. Adding flakes will help to disguise it. Also, make sure to mix all the part-A colored resin together first to ensure color uniformity. You can then pour the appropriate amount of the part-A in with each container of the part-B when you mix the batches. Awesome! Thanks a lot!! That’s really helpful! If I grind the entire garage floor first, is it necessary to also use degreaser prior to coating? Or will the grinding handle any stains? Hello Chris. Any heavy stains should be tackled first with a degreaser. After grinding, be sure to check those areas and make sure they will absorb water. If they don’t, then you will need to degrease further. Grinding only removes a very thin layer of concrete at the surface and will not clean deeply embedded oils and etc. I’am having a home built and the pad for the garage was poured about 7 months ago and the home is almost done. I just purchased a kit from roll on rock with a polyurethane top coat. My question is should I diamond grind the new concrete or acid etch the concrete? No one local had the proper equipment to rent so if I do diamond grind it will be with an angle grinder. I have reached out to the company twice now but have yet to receive a response. If acid etching with muriatic acid will yield a good adhesion then I am more inclined to go that route in order to save some time and my knees. Hi! We used the epoxy garage floor paint from Rustoleum on our garage floor several years ago. It looked good only for a short time. The whole garage floor has peeled off in many areas and it’s still peeling and I have scraped much off. There is still a ton of it left though and the floor looks awful. When we did it we did use muriatic acid. However, I believe the concrete had a sealer on it. We also have a corner of the garage that is a low spot and water just puddles there and this has caused the paint to come up as well. We want to do something with the floor and have no idea how to go about it, or what to do, or who to contact first. What would you suggest for us? We’d appreciate the help. Thanks so much! Hello Sharon. If you want to put down a quality coating it will require grinding the entire garage floor. This will remove the old Rust-Oleum coating, the previous concrete sealer and prep the concrete for a new coating all at the same time. If you want to apply a good coating yourself, then we recommend a single-part polyurea. These are tough coatings, they will not peel when the concrete is prepped correctly, they will last for years, and they are very easy to apply. If you don’t want to do it yourself, we recommend contacting a garage floor coating contractor. This article here discusses how to find a good one. Your other option would be to cover the entire floor with interlocking garage floor tile. This will not require any prep and can be laid over the existing floor. Thank you for all the information! I’m not sure which route we will go, but we do have a low spot in one corner of the garage that’s about 1.5 feet x 3 feet and I was unsure if the tiles would lay properly in that area. Water runs off the car in winter and pools there. Garage floors are rarely level like the slab of the home. Most will always have some high and low spots. The interlocking tile option will work just fine and is engineered to breathe underneath and allow water to evaporate. In fact, the self-draining tiles are commonly used on garage floors that are sloped towards in-floor drains. Hi. Our detached garage was coated with Rust-Oleum Epoxyshield approx 6 years ago by the previous owners. We moved in shortly after. The floor looked great for about 2 years, then started to peel only where our truck tires run into the garage. So I’m not sure if it’s peeling only because of the wear and tear of the tires from our truck, or if the surface of the concrete wasn’t prepared properly prior to coating. Note – we live on an acreage with a gravel driveway, so undoubtedly some gravel gets pulled into the garage tire tracks each time … possibly causing additional grit-wear in these areas. However if that was the case I would assume I’d see a slow degradation of the coating, rather than actual peeling??? Since the peeling is limited to the tire track areas only, is it possible to locally repair the coating by removing the old coating and re-applying, or should I re-do the whole garage floor? And should the epoxy coating last longer in these tire track areas, or is a few years all I can expect? Note – I have no idea if they acid etched or used a grinder for the prep. Hello Alfred. The problem you have is called hot tire pickup/lift and lies with the product and the mild prep solution provided. Rust-Oleum EpoxyShield is an inexpensive residential quality coating that is very DIY friendly, but not the most robust. I suggest you read our article here about what to expect from these type of coatings. Our suggestion is to completely remove the coating via grinding and apply a higher quality product that you can’t buy from your local home improvement center.